It is my great pleasure to welcome you, on behalf of the United Nations in Bosnia and Herzegovina, to this 4th Dialogue Platform Conference. Let me start out with a short word on the Dialogue Platform. The Platform is part of the Dialogue for the Future Programme that was launched by the United Nations in 2015 under the auspices of the Presidency as a national mechanism for fostering dialogue between the citizens, especially the youth, and the decision makers to promote peace, social cohesion and development in BiH. 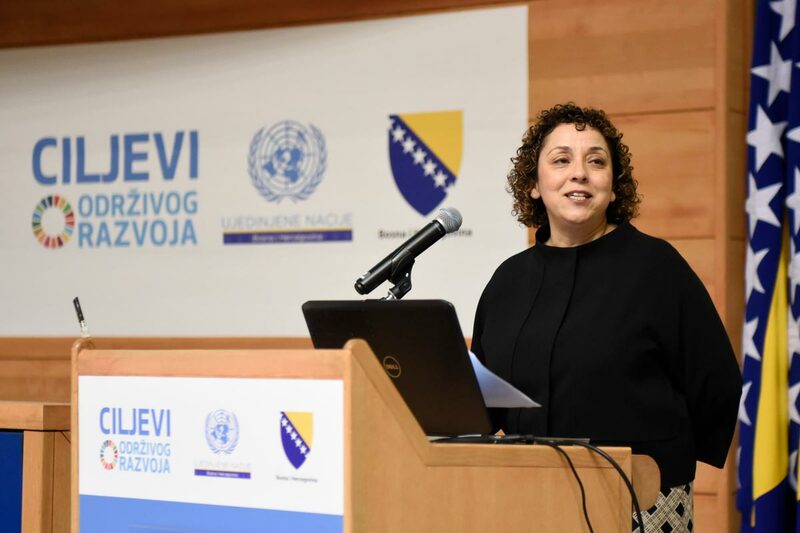 As such, this Platform is an ideal avenue to discuss our topic of today, the implementation of the 2030 Agenda for Sustainable Development in Bosnia and Herzegovina. You will remember that in September 2015, UN Member States, including Bosnia and Herzegovina, adopted a new global development agenda, the 2030 Agenda and its 17 Sustainable Development Goals – the SDGs for short. In a very short time and in an unparalleled way, the Sustainable Development Goals have been embraced by the global community as THE way forward for all nations to ensure people are free from hunger and want, that they live in dignity and in good health, and that we save our planet before it becomes uninhabitable. They are also required to monitor and report on progress on the achievement of the SDGs. Many countries have put the SDGs at the core of their development agendas. You will see from the presentations today that the SDGs are not just for the least developed countries. Many developed countries – countries from Europe and from the neighborhood – have embraced the SDGs and are taking them forward in full force. Our goal today, the reason for this Conference, is to invite you, the people of Bosnia and Herzegovina to do the same. The SDGs are an excellent means to put people and environment at the center of development. A means to leave no one behind – no woman, no man, no child, wherever they are, whoever they are. A means to help us mitigate and adapt to climate change and planetary stress. The SDGs are also an excellent opportunity to give voice to the people of BiH to create a common vision for the future of the country. A vision shared by all. A vision owned by all. A vision that brings economic growth, social progress, environmental sustainability and peace together. Provide information to you on the SDGs and showcase examples from Europe on what countries are doing with the SDGs. For that reason, I very sincerely thank our guests from Switzerland and Montenegro, as well as our partners here from Germany and the EU Delegation for making the time to tell us what the SDGs mean for them, and how their countries are taking the 2030 agenda forward. Our conference today also intends to start a discussion on what the authorities and different parts of the society – all of you – can do to achieve the SDGs. Our Panel later in Conference, with representatives of local governments, of the private sector and the academia as well as key government partners – will discuss and debate what the SDGs mean for them and how they in their special roles can contribute to their achievement. Today, we will also share with you the SDG experience in BiH so far. The tools that we have developed. Results of the many consultations that we’ve had with people from all over the country. Examples of some of our advocacy work. All, to demonstrate to you that you are not starting from scratch. Most importantly, we are here today to call all of you to take action. We call on the authorities and the citizens of Bosnia and Herzegovina to embrace and implement the SDGs. We realize that BiH has recently embarked on a very important path, that of EU membership. We realize that the Reform Agenda is currently the most important transformative agenda for the country. The SDGs are all inclusive. We have no doubt that they will not only complement the Reform Agenda and the EU Accession process but will also strengthen them. Let me end by thanking Mr. Ivanic, for the very clear and strong ownership of the Presidency of the 2030 Agenda as well as their leadership in the Dialogue for the Future Programme. Once again, heartfelt thank you to our partners and guests from Switzerland, Montenegro, Germany and the European Union Delegation for working so closely with the UN to promote the SDGs. Our partners from the SDG workshops and our panelists – thank you for helping us start this national discussion.